Cutie Pie is made from a fuzzy white material with black ears, arms and legs and black patches over her eyes. 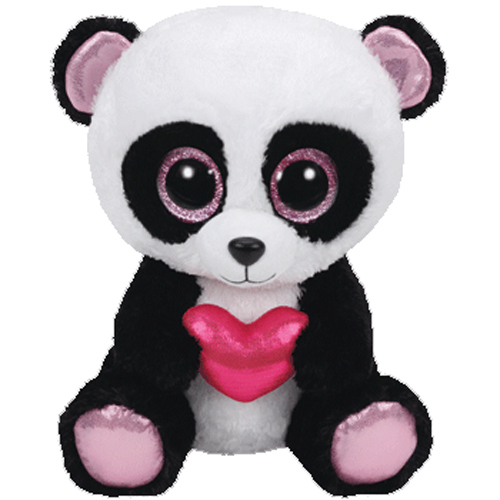 She has large sparkly pink and black button eyes and a black button nose with black stitching for her mouth. The inside of her ears and her feet are made from glittery pink material and she holds a shiny bright pink heart in her paws. If you just hold me close and warm my cold heart. Cutie Pie was released on 1st July 2015. Her Birthday is on 17th April. This is the larger 13″ version of Cutie Pie. She was also released in a regular 6″ size. Cutie Pie is a Valentine’s Day themed Beanie Boo. She was retired on 8th January 2016.